Although the names of Indian dishes are unfamiliar, deciphering what they mean is not nearly as complex as it may seem. Foods are often named by the cooking process involved in preparing them, like tandoori chicken, which is roasted in a tandoor. The names can also be derived from the place the food originated; for example, fish Amritsari is from Amritsar in Punjab. The culture the dish was adapted from is also a hint (Mughlai biryani comes from the famous Mughal culture), as is the main ingredient or the texture or dominant flavor of the finished dish. Once you learn these culinary Indian terms you will feel more comfortable at any Indian restaurant. Your dining companions will rely on you to order for the table! Made with spices similar to those that go into Indian pickles, Achaari dishes can be medium- to very hot and most often will have a tangy flavor. Expect spices like chili, fennel, mustard, carom seed (or Bishop's weed), and cumin. These dishes will be on the drier side with minimal gravy so order them with a "wet" dish like daal (soup-like lentils) or a raita (yogurt preparation) to add textural variety and cut out some of the heat. Achaari-style foods go very well with bread like chapatis (flatbread), parathas (pan-fried flatbread), or naans (leavened flatbread made baked in a tandoor or oven). Bhuna means "to stir-fry" or sauté". Many Indian dishes require spices to be lightly fried—or bhoono-ed—to release their aroma and flavors and prevent them from having a raw taste. Bhuna dishes can range from mild to hot; expect spices like cardamom, cinnamon, cloves, pepper, bay leaves, chilies, coriander, and cumin, and ingredients like onions and tomatoes. Bhuna dishes are characterized by the fact that the meat or vegetable used is cooked in its own liquids and no extra water is added. This makes for medium amounts of thick gravy that go well with both wet and dry dishes. Since each restaurant has its own heat level in bhuna dishes, inquire about the spiciness before you order. Bhurji means scrambled, and bhurji dishes, like scrambled eggs, are stir-fried. They can range from mild to very hot and the main ingredient is usually accompanied by onions, tomatoes, ginger, garlic, and a medley of spices like chilies, cumin, coriander, and turmeric. Bhurjis are dry dishes and, as such, they go well with gravied ones. When ordering a burji, ask how hot it will be and pair accordingly with a mild or hotter gravy dish. Team bhurjis with any of the delicious Indian breads. This is a truly one-dish meal; biryanis—which can range from medium to very hot—are dishes of vegetables, meat, chicken, fish, or seafood cooked into a curry (with medium gravy) with a variety of spices, and then layered in a large dish with pre-cooked, fragrant, long-grained rice. A garnish (like caramelized onions or saffron) is then added and the dish is sealed. The contents are slow-cooked in their own juices, and the result is delicious. Biryanis are Mughlai in origin and made differently in different regions of India. Though biryanis are, by nature, without much gravy, once cooked, the rice is saturated with the juices from the meat or vegetables it is layered with. Expect fragrant spices like cinnamon, cardamom, cloves, pepper, and saffron, among others. This Mughlai (Mughal-style) dish is usually prepared with two onions, which is only fitting considering dopiaza means two (do) onions (piaza) or double onions. One onion is part of a thick gravy to which the main ingredient is added, and the other onion is added raw and then cooked with the main ingredient, or stir-fried until caramelized and used as a garnish. Expect whole spices like cinnamon, cardamom, and cloves, and powdered spices like cumin, coriander, chili, and garam masala. Dopiazas are usually mild to medium-hot and have a good amount of gravy. They go really well with rice pilafs (puloas) and Indian breads. Dum means pressure and implies that the dish is cooked to a certain stage and then the cooking vessel is sealed to pressurize the contents and cause them to slow-cook (for hours sometimes) in their own juices. Dum dishes can range from mild to hot and usually have a medium amount of gravy. This style of dish, which originated in the North, usually contains spices like Kashmiri red chilies, cumin, fennel, cardamom, and cloves, and ingredients like fresh yogurt. They go really well with rice pilafs and all sorts of Indian breads. Translating to meat, gosht can mean either lamb or beef. Gosht dishes, such as daal gosht and dahi gosht, are made in a variety of methods such as karahi, bhuna, and biryani. This tasty style of cooking came about in the days of the British Raj in India. Jal, meaning hot, and freizi, meaning fry, is a stir-fry with a little gravy. Usually, meat like chicken, lamb, or beef is stir-fried with green chilies, bell peppers, onions, and tomatoes and then cooked in its own juices. Spices in a Jalfreizi include coriander, cumin, garam masala, and ginger, and they can be quite hot. Jalfreizis are great with rice pilafs (puloas) and breads. Karahi is the wok-like pan these dishes are cooked in, hence the name. In karahi/kadhai dishes, such as kadhai gosht, the main ingredient is usually marinated in a yogurt and spice sauce and then stir-fried in a karahi with sliced onions, bell peppers, ginger, garlic, and chopped tomatoes. Karahi dishes range from medium to very hot and have moderate amounts of gravy. Spices to expect are coriander, cumin, chili, and garam masala. Coming from Kashmir in North India, this style of cooking is characterized by rich, creamy gravies made up of spices, nuts, and dried fruit teamed with milk and cream. The result is delicious mild dishes, like Kashmiri dum aaloo, that beg to be savored all by themselves. Expect fragrant spices like cinnamon and cardamom. Kashmiri dishes taste great with rice pilafs and Indian breads. This Mughlai dish from North India is typically made by marinating the main ingredient in yogurt and spices like ginger and garlic. It is then cooked in its own juices and a gravy made of onions, lots of tomatoes, green chilies, and whole spices like cinnamon, cardamom, cloves, coriander, and cumin. Kormas can range from mild to medium hot and taste nice with any of the Indian breads. South India is the home of some of the best pepper in the world, and these really hot dishes are probably called Madras curries to identify them with their home in the south of India. Madras curries combine lots of pepper and chili with onion, tomato, curry leaves, and mustard and have a good amount of gravy. They taste lovely served with piping hot plain boiled rice and even with typically North Indian breads. If you're being adventurous and ordering a Madras curry, add milder dishes like daals (lentils) to tone down their heat. This name comes from the word Makkhan which means butter. These typically North Indian dishes are cooked in butter and have a substantial creamy gravy in which tomatoes play a predominant role. Makhni dishes are usually mild to medium hot and made with chicken, vegetables, or lentils. Though they taste nice with rice dishes, Makhnis are best had with North Indian breads. Malai dishes have a good amount of creamy gravy, as malai means cream. This gravy is mild and usually made with onions, tomatoes, ginger, and garlic to which spices like coriander, cumin, and garam masala are added. The cream is added to the recipe as a finishing touch. Because the dish is mild, you can pair it with a hotter, relatively drier side dish. Next time you order Indian food, try malai prawns and malai kofta. Masala typically means spice mix so recipes for masala dishes are as varied as the chefs that cook them! They can, therefore, range from medium to really hot but will usually have a thick, but not very substantial gravy. Order "wetter" dishes like daals and rice pilafs (pulaos) to go with a masala dish. Mughlai cuisine came out of the Mughal rule in India. Food was rich and cooked with aromatic spices, nuts, and dried fruits. Most Indian restaurants interpret this as mild to medium-hot cream and nut-based gravies, rice dishes with lots of nuts and dried fruits, and rich creamy desserts. Expect spices like saffron, cinnamon, cardamom, cloves, and nutmeg. Gravies are usually abundant in Mughlai dishes so they go well with rice dishes and breads alike. The word saag is mostly used in connection with leafy greens like spinach, fenugreek, mustard greens, and dill. In India, saag is not just cooked by itself (like in a sarson ka saag) but often combined with all kinds of meat, fish, chicken (as in chicken saagwala), and vegetarian ingredients with great success. The greens in these dishes may be chopped fine and cooked or first cooked and then creamed. Spices used in saag dishes include cinnamon, cloves, ginger, chili, coriander, and cumin, among others. Saag dishes are mostly mild with a medium amount of gravy. They go really well with breads, and daals (lentils) are the perfect side dish to order with saag-based foods. Shahi, which means royal, are dishes that are similar to Mughlai in that they have mildly-flavored, rich, creamy gravies that might contain nuts and dried fruits. Shahi-style foods go well with rice dishes and all kinds of Indian breads. Tandoori chicken, tandoori fish, and tandoori paneer all get their name from the tandoor (clay oven) they are cooked in. 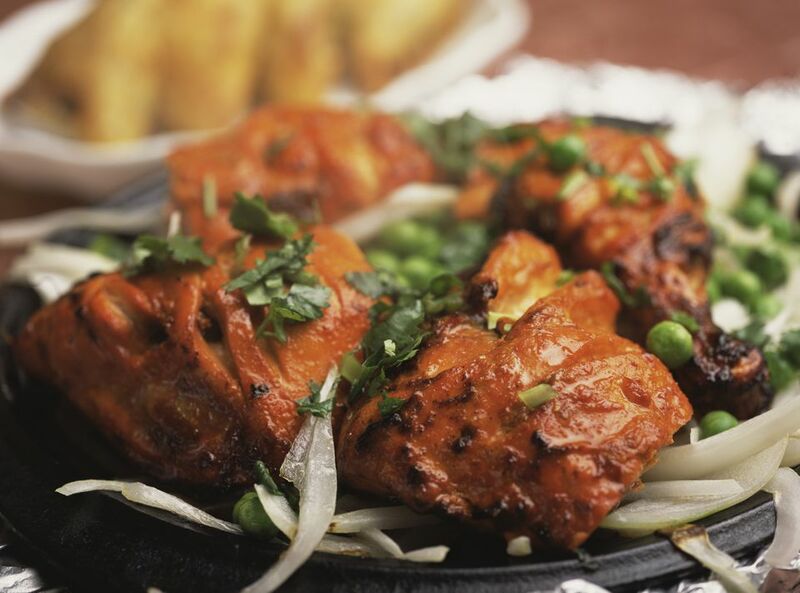 Tandoori dishes are marinated in a spice mix including cumin, coriander, cinnamon, mace, ginger, and garlic and then cooked in the tandoor. Tandoori dishes are medium to hot and without gravy. Order dishes like kaali daal (black lentils) and naans with tandoori foods. Tarka, tadka, baghaara—all these words mean tempering, which is a process used for flavoring certain dishes. To temper a dish, oil is heated and spices like cumin, coriander, mustard, fenugreek seeds, curry leaves, red chilies, and garlic are added to it and fried. This spice-flavored oil is then added to the dish as a final touch. Tadka dishes usually have lots of gravy and are mild to medium-hot. Order a rice dish or Indian bread to go with tadka foods. Tikka means bits or chunks while masala means spice mix. Tikka dishes consist of chunks of marinated, grilled meat cooked in plenty of thick tomato-based gravy that is mild to medium-hot. They go perfectly with Naans. One of the most popular Indian dishes is chicken tikka masala. More of a style of eating than a dish, Thali gets its name from the dish it is served in—a thali, or platter. The thali is set with a number of small bowls (katoris in Hindi) containing all sorts of vegetarian and non-vegetarian foods. Rice, bread (like chapatis), pickles, chutneys, and a dessert are also usually included, making for a whole meal in one plate! The only downside is the dishes in a thali are usually pre-set so you don’t get to choose the ones you want. Seriously hot, vindaloo dishes have their home in coastal Goa in western India. Vindaloo spice mix is made by grinding lots of dry red chilies along with whole spices like cinnamon, cloves, and cumin in vinegar. Vindaloos have plenty of gravy and are usually made with pork but can also be cooked using beef, chicken, fish, or lamb. Order rice dishes and a vegetable to go with vindaloo-style foods.